The Technical Preview of Windows 10 may not have every feature of the upcoming operating system, but Microsoft has revealed that over a million people are testing it out regardless. These users have sent 200,000 nuggets of "user-initiated feedback" - or "UIFs," as Microsoft apparently calls your tips internally - so far. 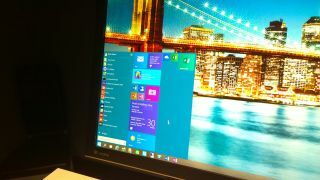 It's been two weeks since the Windows 10 preview version launched, and Microsoft Corporate Vice President of Operating Systems Joe Belfiore wrote in a Windows blog post that testers have so far been "a vocal bunch." "It's been awesome to see so many of you joining the Windows Insider Program and letting us know what you think about the Windows 10 Technical Preview software," Belfiore, who's in charge of phone, tablet and PC design at Microsoft, wrote. Belfiore echoed Microsoft Executive Vice President of Operating Systems Terry Myerson in saying that Windows 10 "is going to be a different Windows." He promised that Microsoft plans to share its "plans and progress" with users "earlier and more often, as we want to build a Windows that everyone will love and really enjoy using." Interestingly Belfiore also wrote that only 36% of Windows 10 preview users have cautiously installed the OS in virtual machines, with the remaining 64% going all-in and committing it to actual PCs. He wrote also that 68% of users launch more than seven apps a day, which among other stats indicates to Microsoft that people are really taking Windows 10 out for a spin and not just submitting feedback after fiddling around for a few moments.